This weekend we had Josh's 10 year Army reunion. 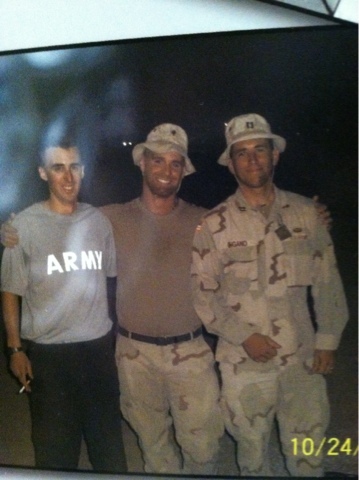 His first deployment was in 2003-2004 and I met him shortly after he came home. For some reason I was nervous to go to this reunion. Most of his Army events make me emotional. Possibly because I am extremely proud of him or maybe because I know how much stress deployment effects ones family. At any length, I am walking around at this thing, browsing collages of photos and holding back tears. He looks so young in these pictures. Most of the men look like teens. These photos are of them in Iraq, the day after the war started. They are smiling and goofing around. Then the inevitable happened. We are asked to be seated and one of the soldiers has a speech prepared. She informs us about the empty table that is set up when you walked in. It is set up in memory of 2 fallen heroes. Josh's unit had lost 2 soldiers from that year. At this point I start fidgeting on my iPhone because my eyes are now filled with big wells of tears. She describes the symbolism of what is at this table. 1. The place setting, representing your wish that the fallen could be with you celebrating. 3. A Long stem rose to represent the families who love and keep faith with the men and women who serve. and a red ribbon that is for those that are MIA. 5. A upside down champagne glass, displaying that this soldier will not be able to participate in the happy toast for this evening. 6. The lemon wedge on a bread plate, the bitter loss of life. 7. 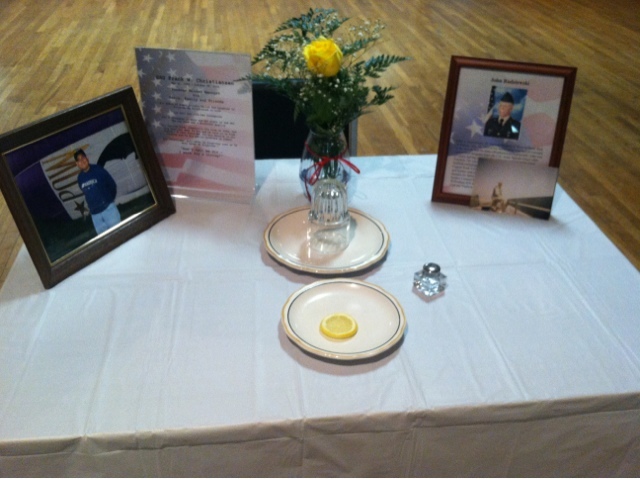 The salt that is sprinkled on the lemon, representing tears of the loss of life of this fallen soldier. 8.And an empty chair at this lone table, representing the missing comrades. Now tears are running down my cheeks and I have a huge lump in my throat. I'm am embarrassed to look up as I don't know many of these soldiers and I am confident that these brave men and woman are listening with pride and courage. These marriages and families survived deployment. And it's ten years later, so they have also conquered the transition. 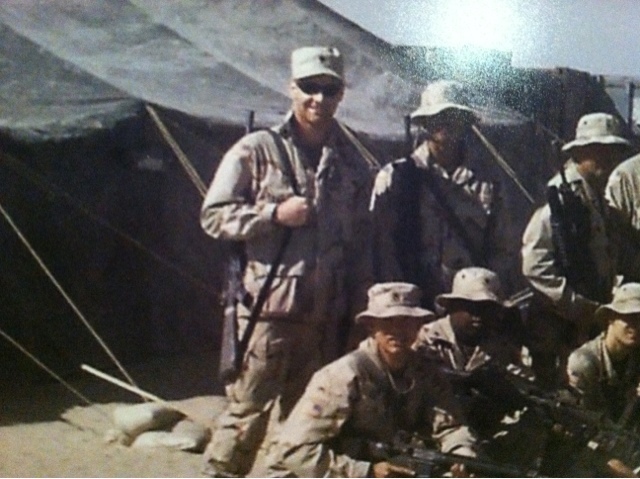 There are only a few men that are still in Josh's unit that deployed with him in 2010. Most of the others have retired. I assure you that at his next 10 year reunion for his most recent deployment, I will be the same emotional mess. However, these men and woman I know. I skyped with them, sent packages to them and they helped my husband come home. They came to our wedding. This is family. I will be drinking heavily at this event. In this very moment I am blessed that my soldier came home. Twice. There are days that I hate what he does, but this family and union that comes together to celebrate the values of the US Military and the bonds that go with it are amazing. These men and women are best friends. It didn't matter that they hadn't seen each other in 10 years. These friendships didn't skip a beat. To say the least, I'm happy that I went. It makes the day to day struggles that we have now look like peanuts. 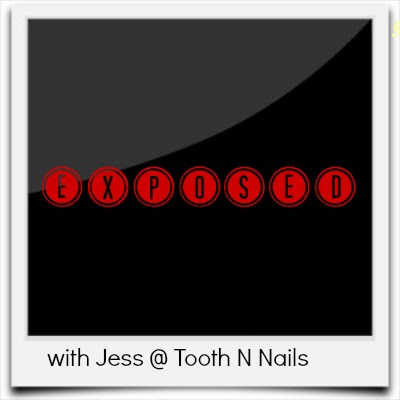 On a lighter note, don't forget to have a guest scheduled to post on your blog Thursday for my new link up, Exposed! Let's get these girls out there! Wow I'd be a crying mess too! 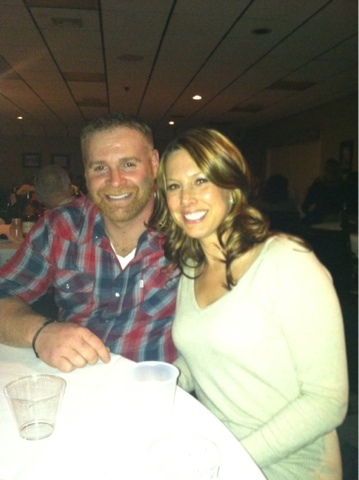 Thank you to your husband for serving and thank you for supporting him like you do. Will he be deployed again? I break down in tears at baseball games when they honor the military. I wouldn't have been able to keep it together at an army reunion! That is so touching!!! 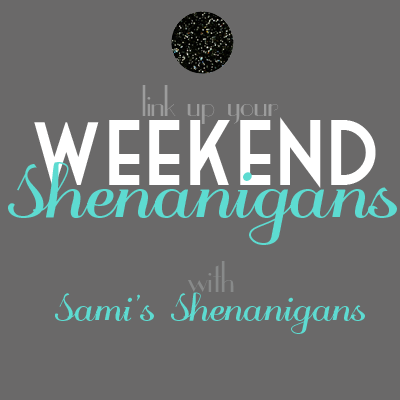 I think it is nice to see something like this instead of the normal stuff we blog about. It is awesome that you support him. His is also amazing for supporting our country and fighting for us! What are hard event to attend, of course tears are shed. I cry at the National Anthem without fail. My Dad is a Vietnam vet, he always made us stand whenever it was on the TV. He is still affected to this day. Such love and respect to those who serve and who have served! I just teared up reading this. Military men and women mean so much to me. Sorry this was so hard. oh wow, great post. that is so moving and I would absolutely feel emotional, i did reading this! I'm crying now. Beautiful post. At the Marine Corps balls I always cried when they did a toast to the fallen and the empty table they have set up for them. I got tears in my eyes reading this post, I kid you not. I would have had to excuse myself during the speech. I cannot handle them kind of speeches, my heart hurts from reading this. This was an amazing post. I honestly teared up!!! The strength you all have is beyond words. It is so inspiring to see that. thank you to your hubby and all the other men and woman out there! First off, thank your husband for his service AND thank YOU! You should be commended as well because you are such a strong woman. 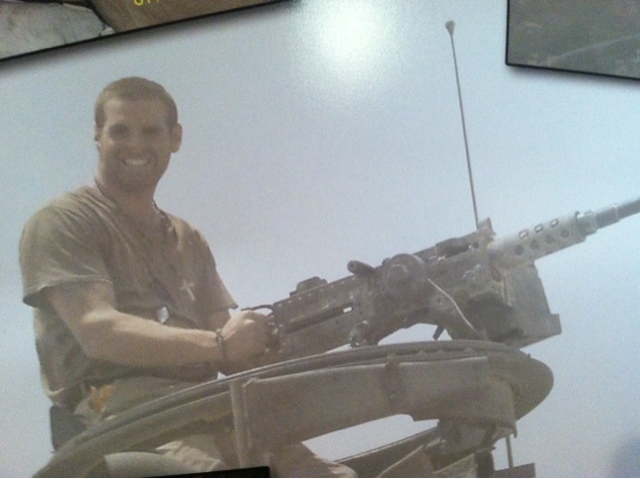 We are so lucky to have brave people like your husband and those he serves (served) with. This post tugged at my heartstrings! Tear!